I remember when this ‘baby’ was discovered over a year ago and became a national sensation throughout Peru. I was living in Huanchaco on the Peruvian coast at the time, and I made a mental note to put this on my ‘must see’ list. This past week, we finally made it to the quaint little town called Andahuaylillas, just an hour outside of Cusco, where the mummified remains of this baby resides and I was blown away with what I saw! This baby is being referred to as an “Alien Hybrid Human Baby”. Peruvian anthropologist, Renato Davila Riquelme, found the remains in the highlands, near his home in Andahuaylillas. Reports confirm Sr. Renalto is convinced that these are the remains of an alien human-hybrid baby, which are now on display at his private museum called Museo Andean Rituals. Skulls are humanity’s foremost symbol of death, and a powerful icon in the visual vocabularies of cultures all over the globe. We have some spent time with researcher Brien Forester (and interviewed him for a podcast here) who has co-authored a book called The Enigma of Cranial Deformation. After reading about these cranial deformation and visiting the Paracas History Museum, I have started to see the subtle differences between those skulls that were elongated or deformed through a process of binding and flattening to those who may have been naturally formed that way. The baby in Andahuaylilla presents an interesting challenge to the critics. The size of this baby alone, does not indicate the baby was anywhere over 6 month old. I would guess this baby didn’t live past 3 months based on it’s size and my memory of Miro at that age. I would imagine that the deformation would would take longer than that, even considering the baby’s head is naturally soft during that stage. However there were other apparent anomalies, like the the large eye sockets, the ultra thin bone and the way the baby’s eye sockets lined up directly with the jaw bone. Besides the baby being 50 cm tall, having a conical head, large eye sockets, the baby also has fully formed molars, not congruent with the characteristics of any ethnic group on Earth. My interest in the subject has led me to discover that many other strangely “deformed” hominoid skulls have been discovered all over the world. 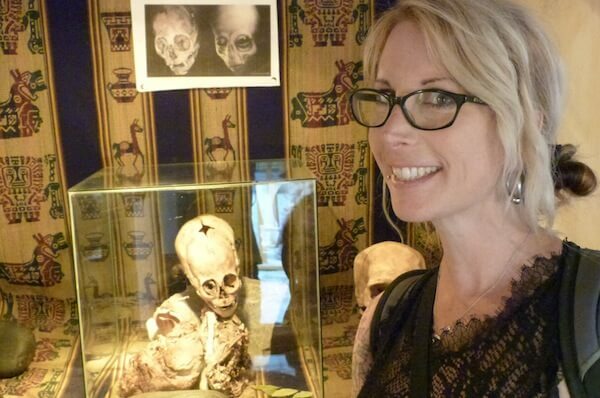 One, called the Starchild skullfound in Mexico, is currently the subject of scientific scrutiny and DNA testing and researcher Lloyd Pye has led the way in this type if investigation. Is it alien or at least an alien-human hybrid? “Peruvian anthropologist Renato Davila Riquelme has discovered what appears to be the mummified remains of an alien-like creature, including a triangle shaped skull nearly as big as its 20-inch-long body. The skeleton was found south of Cuzco, at an Apu (sacred mountain) associated with Viracocha, the creator god of the Inca civilization. And so these mysteries continue to intrigue me. (Read about my adult ‘unschooling’ here.) Miro and I continue to visit archeological sites where the mysteries of the past are displayed throughout ruins. But for me, the once-alive-remains are most intriguing. I imagine connecting with this life as if it standing before me today. Each time Miro and I experience elongated skulls in museums across Peru, we question whether or not we are looking into the remains of ‘ancient aliens‘.